Use these credits to install programs (you cannot use Sahasrara to install a program that trashes Sahasrara). Out there, the thousand-petaled lotus symbolizes detachment from illusion. In here, it is the birthplace of a higher consciousness. Something infinitely pure. Sahasrara: aka "the White Lotus"
From Hindu tradition the Sahasrara or White Lots is described as having 1,000 multi-colored petals located just above the top of the head. Sahasrara symbolizes detachment from illusion; an essential element in obtaining higher consciousness of the truth that one is all and all is one. Sahasrara is an economy program definitely worth a look. 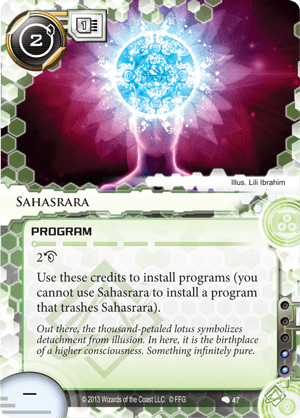 Sahasrara can pay additional copies of itself to be installed, ramping up an economy quite quickly. Shaper ID's like: Kate "Mac" McCaffrey: Digital Tinker & Hayley Kaplan: Universal Scholar can work in tandem with Sahasrara for or efficiency respectively. Chameleon can pop onto the runner's deck turn after turn at no cost out of the runner's hand. Even more powerful once 1+ copies of LLDS Processor are in the runners rig as well. Autoscripter adds even more option to the runner by handing the used to install back to the runner for other purposes. 2 frees up some economy to focus on runs & other expenses each. Return on investment turn around happens the first time it is used. Shaper decks in particular often feature installation-based synergy and so could have a lot to gain by including Sahasrara, the sooner in the game the better. If the runner has the available deck slot(s) & this card can offer a lot even if not supported by a specific combo.